As a boy, Mick Manning listened to his father' s hair-raising tales about life as an RAF airgunner during the Second World War. Now, years later, he has carefully recreated his father's stories, writing them down as if his dad was speaking the words. In collaboration with Brita, he has illustrated them too. It' s for Charlie' s grandchildren - and for everyone. True courage colours the tail-gunners story. || For real life adventurers, there is Mick Manning's TAIL END CHARLIE. Brilliantly illustrated by Brita Branstro m, it tells the true story of the author's father as a youthful airman during the Second World War. Using comic strip, contemporary photographs and full-page pictures, it covers both everyday details and moments of extreme danger. || The book is presented in the style of a scrapbook journal. The typed wartime 'flight log' gives us a personal voice and provides a narrative drive which makes the story compelling and coherent...The illustrations with their speech bubbles play a huge part in the success of the book. The combination of a strong line and often vibrant colours brings the experiences vividly to life. There is immense variety in how each double spread is designed. Interesting contemporary ephemera, including magazines, comics and playing cards, bring information and variety. 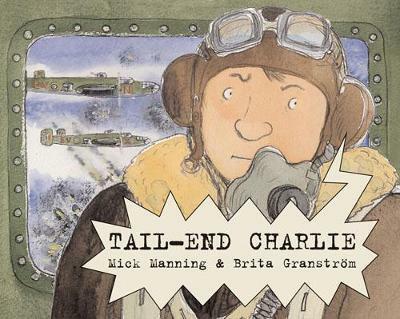 Manning and Granstrom's books nearly always have school relevance and this one would enrich enormously primary school children's studies of the Second World War. The combination of a riveting personal story, much general information about the war and a detailed glossary make this an excellent resource. and reading it could lead to young readers exploring their own family histories for stories that should never be forgotten. || The book fulfils its aims and gives an excellent picture of the life of the airmen and also some intimations of the deprivations for civilians. It is a page-turning read, excellently presented and illustrated in an eye-catching manner. || An easy, interesting read that's helped by the visual presentation of the information. Children can get lost in the book, hardly realising how much they are reading - and learning. || This account of one RAF man's war fits perfectly with imaginative illustrations, many of which are a collage of real war memorabilia. The glossary is a mini history in itself. A most attractive book which informs through both the story and the pictures. MICK MANNING and BRITA GRANSTROEM have developed a unique approach to picture information books over the last 21 years. Sharing the illustration between them and mixing words and pictures in inventive ways, they have won many awards, including the Smarties Silver Award, and are five-times winners of the English Association Award. Mick fell in love with wildlife on primary school nature walks many years ago, and has an MA in Natural History Illustration from the Royal College of Art. Brita grew up on a farm, and has an MFA from Konstfack in Stockholm. They spend a lot of their time having both Swedish and British Wild Adventures with their four children. Their other books for Frances Lincoln include: The Beatles, Charles Dickens, Scenes from an Extraordinary Life, What Mr Darwin Saw, Tail-End Charlie, Taff in the WAAF; The Secrets of Stonehenge, Woolly Mammoth;and the Fly on the Wall series: Roman Fort, Viking Longship, Pharoah's Egypt, Greek Hero. MICK MANNING and BRITA GRANSTROEM have developed a unique approach to picture information books over the last 21 years. Sharing the illustration between them and mixing words and pictures in inventive ways, they have won many awards, including the Smarties Silver Award, and are five-times winners of the English Association Award. Mick fell in love with wildlife on primary school nature walks many years ago, and has an MA in Natural History Illustration from the Royal College of Art. Brita grew up on a farm, and has an MFA from Konstfack in Stockholm. They spend a lot of their time having both Swedish and British Wild Adventures with their four children. Their other books for Frances Lincoln include: The Beatles; Charles Dickens, Scenes from an Extraordinary Life; What Mr Darwin Saw; Tail-End Charlie; Taff in the WAAF; The Secrets of Stonehenge; Woolly Mammoth; and the Fly on the Wall series: Roman Fort, Viking Longship; Pharoah's Egypt; Greek Hero.